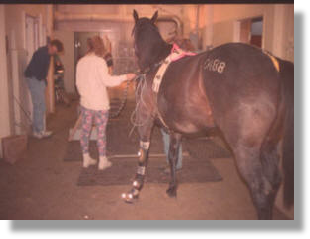 As the staff farrier for University of California at Davis Veterinary Medical Teaching Hospital, Kirk was working on a case load of 300 to 500 lameness cases a year. Most of these eventually were shod in bar shoes and pads. Although there was an improvement in a large number of cases, he was still not satisfied with the overall results. Treating such a large number of horses year after year, it became apparent that certain things brought results and others were really not so successful. A wide web bar shoe provided the most protection and support but were very difficult to fabricate and apply. Pads of all types performed poorly for major concussion absorption and made keeping the shoes on much more difficult. 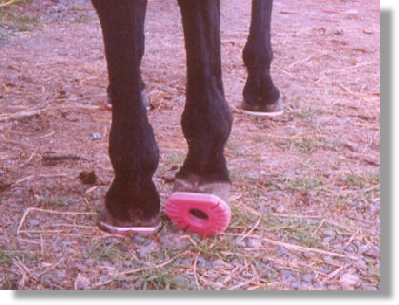 All plastic shoes had some desirable concussion reduction properties but were unstable and unsupportive of the hoof and limb. Some plastic compounds were very slippery while others showed good hard surface traction. 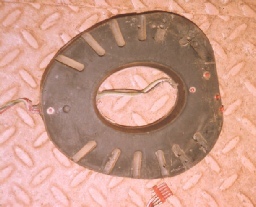 The available plastic shoe designs made nailing difficult and many could not easily accommodate different foot shapes. The absence of a shoe that met the desired criteria necessitated the creation of a better "mouse trap". Using the knowledge gained by the use of all types of other shoes, it became apparent that the new shoe would need to be a composite shoe. Composite shoes have a metal core with an elastomer component. The elastomer has to bond securely to the metal in order to work as a unit. Rubber and plastic compounds both had some desirable characteristics but both had drawbacks. The new polyurethanes provided the answer. Poly-urethanes have tenacious adhesion to metal and can be formulated in an infinite range of properties of wear and concussion absorption. For a period of two years the shoe was refined in shapes, in compounds and in design. In 1990 we applied for and were granted a patent. The Sneaker was born and running. 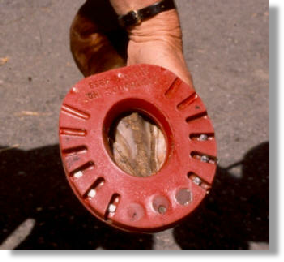 This is a 2nd generation Sneaker applied to an endurance horse to test a new compound. Initially colors were used to differentiate between compounds so we could evaluate the properties. Now, however, the compound is the same and the colors vary for variety and visibility. A dark red color was introduced in '96 followed by a dark brown to black. In 2008 we upgraded to a newer more durable compound which is available in dark brown and yellow. Endurance riders like the yellow for the visibility on the trail. With just a glance, you can tell if all shoes are still in place. Another modification is a 45° bevel to the side of the center hole to facilitate cleaning. 2012 marks the 24th anniversary of the first pair of Sneakers that were cooked up in our kitchen oven. Over the years we have made various improvements in the shape and in the durability continuing to make the Sneaker the best performance and therapeutic shoe anywhere in the world. 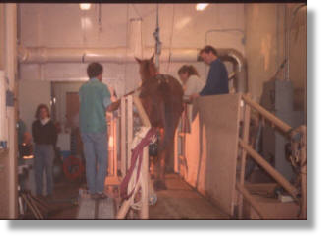 In 1990 a research program for the exercise physiology for horses was conducted at UC Davis on a high speed treadmill. During the course of the study the horses were stabled on concrete and had a turnout of decomposed granite. In the course of the study all the horses suffered some form of lameness because of the harshness of the environment. 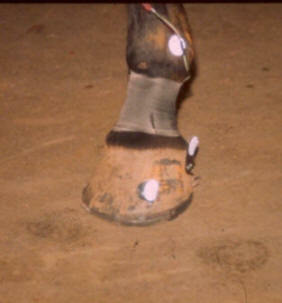 The horses were then shod with Sneakers to see if they would help with their soundness issues. The results of the switch to the Sneakers resulted in a 100% return to soundness of the horses and a completion of the experiment which had heretofore been incomplete for over a year. It is now standard operating procedure by some researchers to put their horses in Sneakers at the outset of a study using treadmills. 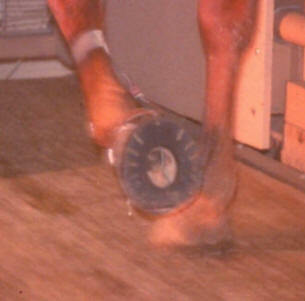 These photos are of a study done to correlate the mechanical sequences of the hoof flight with high speed videography and a computer analysis to compare the parity of the techniques. Sneakers were fitted with micro switches to give a mechanical record of the footfalls, breakover and liftoff. Lights were activated by the switches and recorded by high speed video. During this study the computer proved so sensitive it was able to detect the tread compression of the Sneaker! At the trot, it was measured that the tread compresses several mm during each stride.